One of the problems with heat recovery boilers behind incinerators of solid,liquid or municipal solid wastes is high temperature corrosion associated with the formation of complex eutectics which have a low melting point and deposit as slag on boiler heating surfaces.This is difficult to get rid of and results in high temperature corrosion,fouling problems and consequent higher exit gas temperature from the boiler and consequent lower steam generation.Another concern in these applications is the presence of corrosive gases such as chlorine and hydrogen chloride,which corrode the boiler tubes,particularly those operating above 800 F,resulting in tube thinning and failure.Chlorine attacks steel even at 400 F-500 F.There are several aspects to the corrosion mechanism.Low temperature corrosion problems in boilers are discussed elsewhere. High temperature liquid phase corrosion is caused by molten alkali metal salts such as metal chlorides and their eutectics having a low melting point-see table below.Slag thus formed attacks the protective iron oxide layer and in course of time eats away the base tube material. In addition several non-ferrous salts are formed with chlorine,which also have very low melting points.These also deposit on low temperature surfaces such as evaporator tubes and corrode them. By reducing the gas temperature to convection sections below the melting points of these salts, one can minimize the slagging concerns.However this may not not be always economically viable as a very large radiant furnace would be needed in some cases. Corrosion also occurs due to a non-uniform furnace atmosphere caused by partial oxidation,which results in a reducing environment in which CO and H2S are produced.These gases react with the protective layer of iron oxide formed on the tubes exposing them to a corrosive attack. This situation is common in MSW plants. 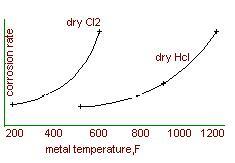 Corrosion due to the presence of hydrogen chloride is severe at higher metal temperatures as shown in the figure below.When plastic compoundsare incinerated,hydrogen chloride vapors are formed as also chlorine.Chlorine attacks steel at low temperatures.Hydrogen chloride attacks surfaces operating at high tube wall temperatures,say above 800-850 F,such as superheater tubes.Using high chromium,nickel alloys or stainless steels may reduce the corrosion rate but failure of these tube surfaces is likely over the long haul.There are examples of superheaters operating at 900-1000 F in MSW applications which had to be replaced every few months! There are a few steps that can be taken by the boiler designer to minimze these slagging problems and consequent corrosion; however they cannot be completely eliminated. Ensure that the gases entering the convection section are cooled adequetely. Thiscan be accomplished by using a large radiant furnace section.However this is expensive and makes the boiler design more complicated. Flue gas recirculation could be used to recirculate and mix cool gases from the boiler exit with the hot incoming gases,thus reducing the gas inlet temperature to the boiler.However this increases the mass flow through the boiler and hence its initial cost.Operating costs are increased by using the recirculation fan. Since hydrogen chloride corrosion rate increases signiifcantly beyond 800 F(even high chromium,nickel steels have failed in due course),the boiler steam parameters may be selected with care. Instead of say going for 1000 psig,1000 F steam,one may consider 600 psig,650 F steam,which results in lower superheater tube wall temperatures and hence increases its life.It is also suggested that the design have a slag screen section,with wide spaced tubes to prevent accumulation of slag,followed by evaporator tubes and then the superheater as shown above. This will increase the cost of the superheater (due to the lower log-mean temperature difference) but will increase its life and save on maintenance/replacement costs.Use of retractable soot blowers at the hot end is suggested,while rotary blowers may be used at cooler ends. Some designs use rapping mechanisms to shake off the dust and deposits. Fire tube boilers have limited flexibility compared with water tube boilers when it comes to handling hot slag laden,corrosive gases.It is difficult to clean the front end of the tube sheet.Though the boiler may be less expensive compared to a water tube design,the author suggests that a throrough review be made before selecting the cheap option,which can result in headaches for the plant operating and maintenance personnel. In hydrogen or ammonia plants,where process gas streams(containing methane,carbon monoxide,carbon dioxide,hydrogen,water vapor at high gas pressure) generate steam in waste heat boilers,hydrogen embrittlement is a concern. The absorption of hydrogen into the metal results in loss of its ductility and failures are likely at higher tube wall temperatures due to formation of methane when hydogen reacts with carbon in the steel. Increasing the chromium content of the steel(using T11,T22 material for the boiler tubes) helps to minimize some of these concerns,as the low-chromium alloys help form stable carbides. The Nelson's chart(see my book on waste Heat Boilers)gives an idea of the chromium content to be used as a function of partial pressure of hydrogen and tube temperature.Metal dusting concerns which also arise in these boilers are minimized by use of low-chromium alloy steels. Corrosion is a complex subject and simple generic solutions cannot be dispensed through papers or articles . Each case has to be evaluated on its merit and corrosion consultants should be contacted for specfic problems. The article only suggests a few thoughts,potential concerns and solutions from boiler design view point.